Thank you so much for visiting our online store. Our team is excited to provide you with an impeccable online shopping experience and remains available to assist you at any time. It is our mission at Premium Truck Parts to supply you with the right parts needed to keep your truck working in tip top shape, at a great discount. Simply put, if you are in need of a replacement part for your vehicle, you've come to the right place. 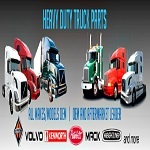 You'll find a huge selection of new, and aftermarket parts for Volvo, Mack, Freightliner, International, Peterbilt, Hino, Fuso, Kenworth, and trailers. You can shop for all of your parts online through our safe and secure website, or you can call our customer service toll free number at 1-855-961-1100 if you have any questions about our parts, or to buy over the phone. If you don't see what you need, please call us or fill out the request form today. With over 100 years combined experience, Premium Truck parts customer service representatives are the most qualified to answer your questions about all of our new and aftermarket truck parts. Look no further than Premium Truck Parts for your aftermarket, original equipment (OE) replacement truck parts and get your truck the new parts it needs today.